ABSTRACT: Will climate change threaten wildlife populations by gradual shifts in mean conditions, or by increased frequency of extreme weather events? Based on long-term data (from 1991 to 2014), the aim of the present study was to analyze and compare the sensitivity of predator-prey demography to extreme climatic events versus normal, albeit highly variable, annual deviations in climatic conditions in the Australian wet-dry tropics. From 1991 to 2005, predators (water pythons, Liasis fuscus) and their main prey (dusky rats, Rattus colletti) showed significant climate-driven fluctuations in numbers. These fluctuations were, however, trivial compared to the impact of two massive but brief deluges in 2007 and 2011, which virtually eliminated the dusky rats. The two floods resulted in the pythons experiencing an unprecedented famine in 7 out of the last 8 years causing a massive shift in python demography i.e. a significant reduction in feeding rates, reproductive output, growth rates, relative body mass, survival, mean body length and numbers (from 3173 in 1992 to 96 in 2013). BIO: Thomas Madsen is firm believer in the importance of conducting long-term field studies in order to make any relevant/significant conclusions about evolutionary processes. For example, his study on Swedish adders (commenced in 1981 and still running) has revealed the evolutionary significance polyandry. 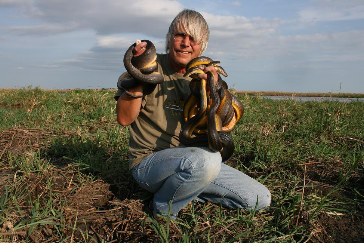 His study water pythons and dusky rats in the Top End of Australia (initiated in 1989 and is still running in collaboration with Beata Ujvari) has revealed the dramatic effects of climate (and climate change) on the population demography of predators-prey interactions in the Australian wet-dry tropics.